Sophia has just arrived in rescue. Unfortunately, she arrived in heat so must wait 8 weeks to be spayed. By all accounts - the shelter, the transport volunteer and her foster, she is a sweet girl with a lovely personality--and beauty to boot! Surely worth waiting for! She's on the smaller end of beagledom. 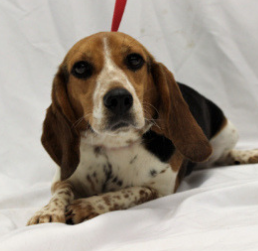 If you would be interested in adopting Sophia, please contact icanhelp@beaglemaryland.org.